Baer Sport-Touring Brake Pads fits: 1991-1992 Lincoln Mark VII. 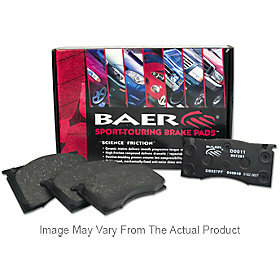 Baer Sport-Touring Brake Pads Features - Ceramic formula for smooth stopping with less dust. The high-friction compound provides consistent performance. Great pedal feel comes from the positive molding process. Mechanically fixed anti-noise shims prevent screeching. Provides increased friction while meeting OE standards for noise and durability. Baer Brake Pads, Baer Sport Touring Brake Pads. Baer . Baer Sport-Touring Brake Pads fits: 1991-1992 Lincoln Mark VII, Baer Brake Pads, Baer Sport Touring Brake Pads. Baer Brake Pads, Baer Sport Touring Brake Pads. WOW SUPER FAST SHIPPING GREAT SERVICE!!!!!!! !